with the body of Richard Warwick in The Unexpected Guest. Photo by Carol Rosegg. BOTTOM LINE: A solid production of an old chestnut, TBTB’s The Unexpected Guest shows that there are joys to be found in the most unassuming of packages. I grew up on Agatha Christie’s murder mysteries – both reading her novels and seeing them on stage (it was a yearly tradition for the Blackfriars Theatre company in my hometown). While I haven’t encountered them much since, The Unexpected Guest brought it all back – the quaint atmospheric setting, the proper British characters, and most of all, the joy of trying to guess “whodunit.” While my theatre sensibilities have changed to where I can now see that Christie is perhaps not the most exciting dramatist, this is no fault of Theater Breaking Through Barriers’ steady, and occasionally even great, production. As is the case with any Agatha Christie mystery, there is no shortage of suspects, I mean characters – your standard assortment of family members, servants, police officers, and a few others, any one of which could be the killer. The cast is somewhat uneven, but along with Viselli’s Starkwedder, I liked Scott Barton as the mysterious neighbor Julian Farrar, Melanie Boland as the victim’s mother, and especially Christopher Imbrosciano as Warwick’s half-brother Jan. Christie’s plays can sometimes drag, especially in Act 2 as we rehearse the various psychological motives (and occasional red herrings), and Imbrosciano brings a youthful energy to the evening that enlivens every scene he is in. It’s also worth mentioning that, since this is Theater Breaking Through Barriers, the cast integrates able-bodied actors with those who have various physical disabilities. 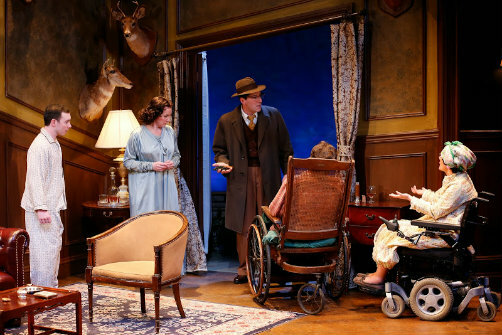 What was most interesting to me was how this drew my attention to the disabilities mentioned in Christie’s script: along with Warwick’s wheelchair, there is his mother’s being “ a little deaf” and the fact that Jan is “retarded” (hey, it’s a play from 1958). While I’m not sure if this was a reason the late Ike Schambelan (TBTB’s Founding Artistic Director) chose this play, it does serve as a trenchant reminder that we are all in fact temporarily abled, one that might not be as noticeable with a more traditional cast. Is this Agatha Christie’s best mystery play? Probably not. While there are of course many plot twists and turns, there are also some slow parts, and the final denouement is…perhaps a bit unsurprising (once you know what it is, of course). Aside from the casting, this is an incredibly traditional production, thanks in large part to Amanda Jenks’s period costumes, Sam Crawford’s sound design with its old-time radio announcer, and Bert Scott’s deer-head covered study, although the forced perspective was a bit disorienting in such a small space (which may have been the point). And just like my hometown company, TBTB gives you the opportunity to hazard a guess during intermission. Also fun is that afterwards the cast assembles onstage to reveal how many audience members guessed each of the different characters. TBTB’s The Unexpected Guest is a perfectly pleasant way to pass an evening – after all, there’s nothing like a good murder to bring people together.